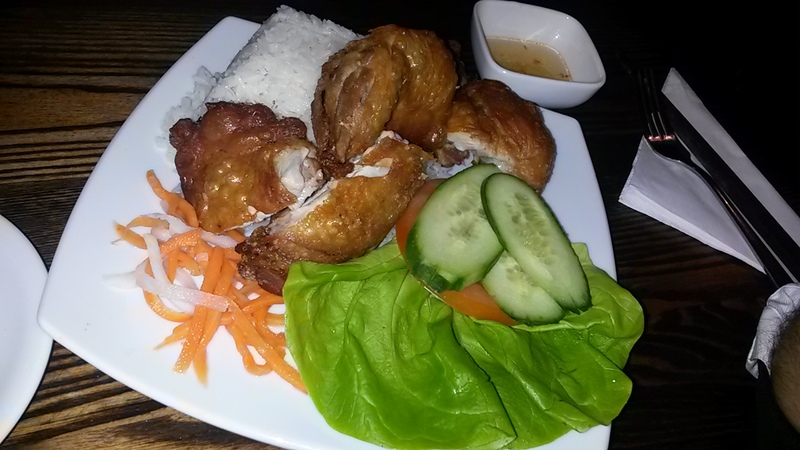 I read somewhere earlier this year that Vietnamese food would be big this year. With the opening of House of Ho in Soho & numerous outlets of Pho around, Vietnamese food has definitely become more accessible than it was a few years ago. However with most Asian cuisines, people need educating before they know what to order which is why going to a traditional restaurant with local waiters is great as you can quite easily learn what is what. Having arranged to meet with a friend and her husband on a Friday (my veggie day) I was all the more conscious of having to find somewhere with yummy veg food. 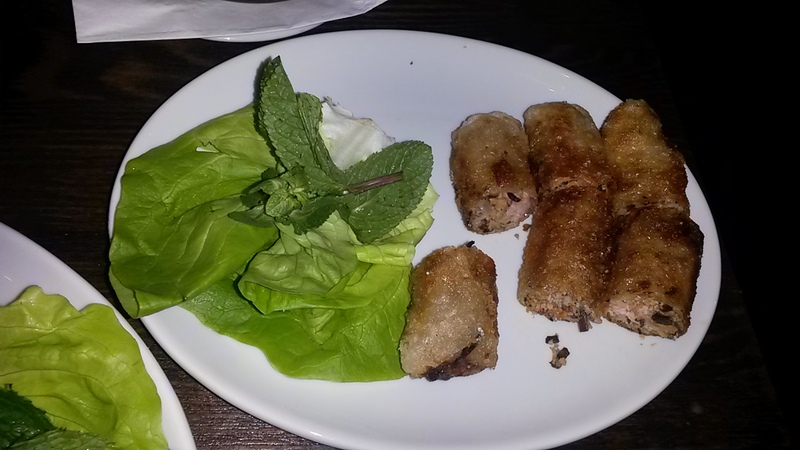 The fiancé & I had popped into Ladudu in West Hampstead for a drink a few weeks ago and having sampled the Vietnamese spring roll, I’d decided we’d be going back some time soon. So when my friend suggested we meet somewhere near Finchley road, Ladudu came to mind and a table was booked. When we arrived the restaurant was 2/3rds full. We sat down and awaited for Mr & Mrs U who arrived shortly after. It didn’t take long before the waitress came round to take our drinks orders. The guys both ordered health conscious Green Tea, Mr R going for the slightly more interesting orange green tea. These arrived in pretty little glass tea pots & we soon realised that the only difference between the two tea’s was that the orange green tea had a few shavings of orange rind for added flavour. The waitress was soon back to take our starter orders. Being a Friday, I joint Mrs U and selected a few veggie dishes for our tofu overload meal. Mr U and Mr R had a far more exciting selection of food to choose from and did a good job of narrowing down their choices. The veggie bits were first to arrive. 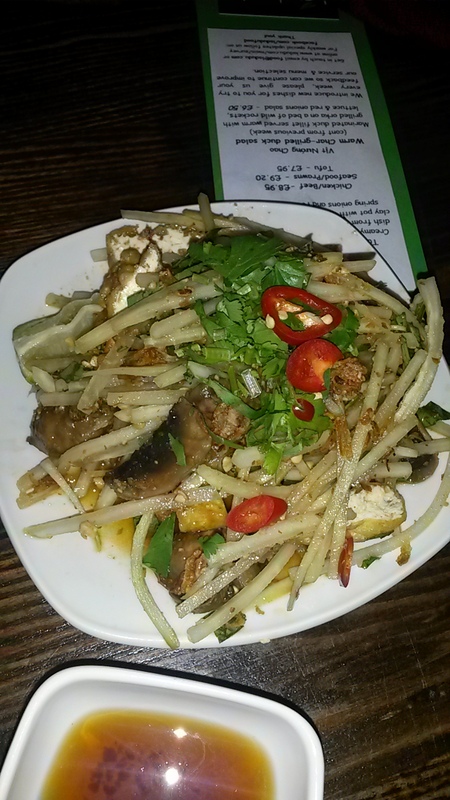 I have a bit of an aversion to papaya salad so couldn’t resist the vegetarian version with mushrooms and tofu. Other than the fact that this was missing some shrimp and didn’t really need the mushrooms or the tofu, the flavours were good although not overbearingly traditional. The papaya wasn’t overly soggy which meant that it still had a great texture. Overall we were all pretty pleased with this. 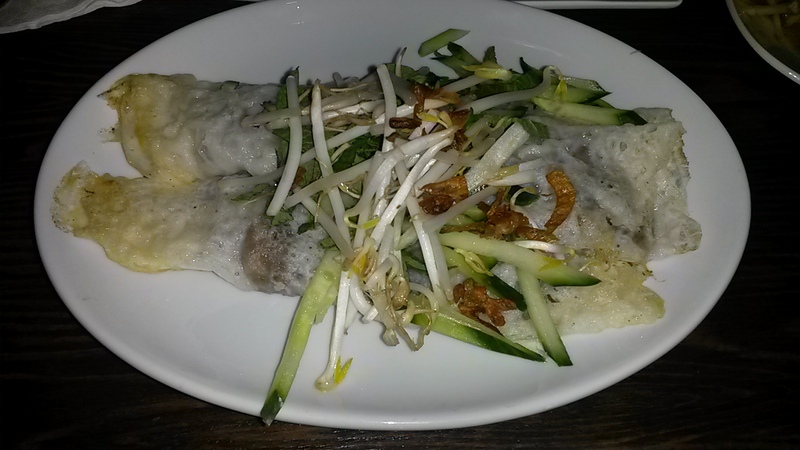 At the same time as the Green Papaya salad arrived the warm rice paper crepe stuffed with mushrooms. Anyone whose tried a South Indian dosa will appreciate that this wasn’t hugely dissimilar to a dosa. Except for it was stuffed with mushrooms and was served with a dipping sauce that wasn’t green coconut chutney!! Although I would have liked the rice paper crepe to have been slightly more crispy, it was nice none the less, albeit very slightly bland. However the sauce soon sorted out that issue! 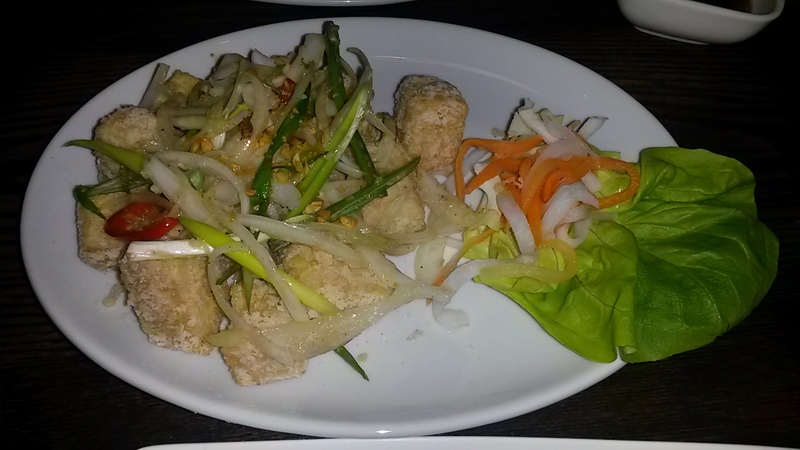 To round off the veggie starters, we’d ordered Chilli & Garlic Tofu. For the veggies out there, Chilli & Garlic Tofu is a bit of a fail safe on most Chinese/oriental menu’s. However I must admit, that the coating on this tofu was slightly different to normal which made it slightly more crispy. There was a good amount of garlic and spring onion served with it which helped to enhance the flavour of the tofu which at times can be quite bland. Whilst we tucked into our veggie starters, the Guys made a quick start on their non veg starters, however I was quick to stop them so I could take pictures! Although the picture above doesn’t do the best job at describing how these Vietnamese spring rolls tasted, the sounds coming out of the guys were positive so I can fairly assume that they were good. I have to admit though, as I mentioned at the start of this post, it was the Vietnamese spring rolls that I’d sampled on my last trip which bought me back, so I can vouch for the fact that they were pretty good. 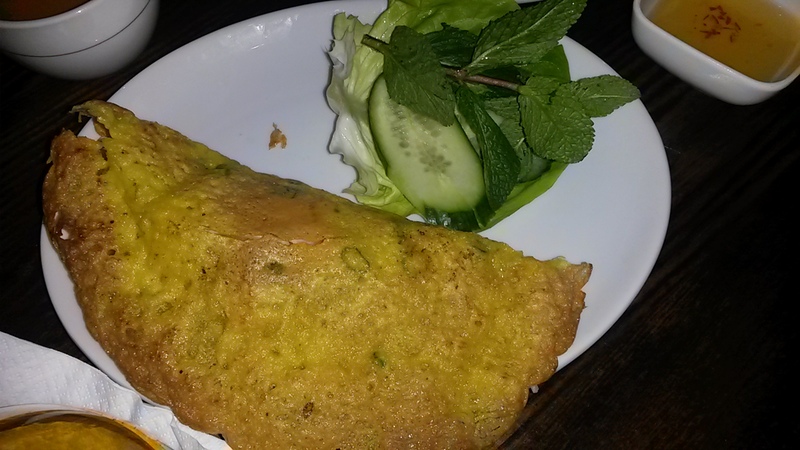 I heard less comments from the guys for the Vietnamese pancake with Prawns. Other than the fact that they said it was nice, the lack of noise would suggest it was only nice, not outstanding. Its fair to say that Mr R is a self proclaimed connoisseur of all things, well anything so the fact that there was very few comments on the pancake can only mean they failed to knock his brightly coloured Ted Baker socks off his feet. After a little pressure was put on us by our friendly waitress, we finally got round to ordering mains. Given the tofu themed starters, we decided to simply continue and order one of the few vegetarian main courses on the menu. So after a little wait time, our mains arrived. Miss U and I had both spotted the Tofu Hotpot on the menu and quickly decided it would be our main course. Having failed to read the description, we were quick to order a side of fresh flat rice noodles. 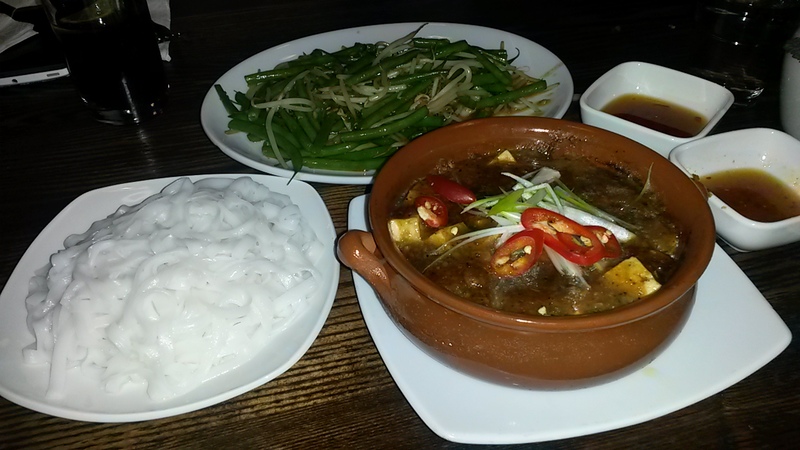 The description however stated the dish was “fresh tofu with shiitaki mushroom, tapioca glass noodles with Ládudu’s special lemon grass sauce, served in a clay pot”. I have to say, we really didn’t need the noodles at all. The Tofu Hot Pot was delicious, the sauce was lemon grassy by slightly sweetly savoury if that even makes any sense. My only issue with the sauce was the fact that it felt ever so slightly too thick. I guess however the thickness meant that the tapioca noodles held the sauce far better than they would have done if the sauce was less thick. We ordered a side of Stir-fry fine beans with garlic which were equally delicious and served to satisfy Mr U’s hunger given that his Pho took so long to arrive! Again from the comments I heard coming out of Mr R I can’t say I was too convinced that the chicken was either moist or tender. In fact the chicken looked slightly more dry than it did moist. Bare with me whilst I await a statement from Mr R to confirm his thoughts on the chicken. Ten minutes was about as long as Mr U had to wait for his Pho to come after all the other food arrived. However he dug into it so quickly I was unable to even capture an image of it. Despite not taking a picture I can confirm that Mr U was very very satisfied by the Pho. See the great thing with men is if they like something, it is perfectly obvious to see. The fact that Mr U was going on about how nice and clean and flavoursome and large his bowl of Pho was, I think its fair to say even though he had to wait for it, he was perfectly happy with the outcome. We decided not to get any dessert and simply skipped to the bill. I must say I did enjoy the food and would definitely consider coming back, if only to try the Pho. Next time your passing through West Hampstead, definitely give Ladudu a try, especially given the fact that they have happy hour on cocktails & also have freshly squeezed juices!